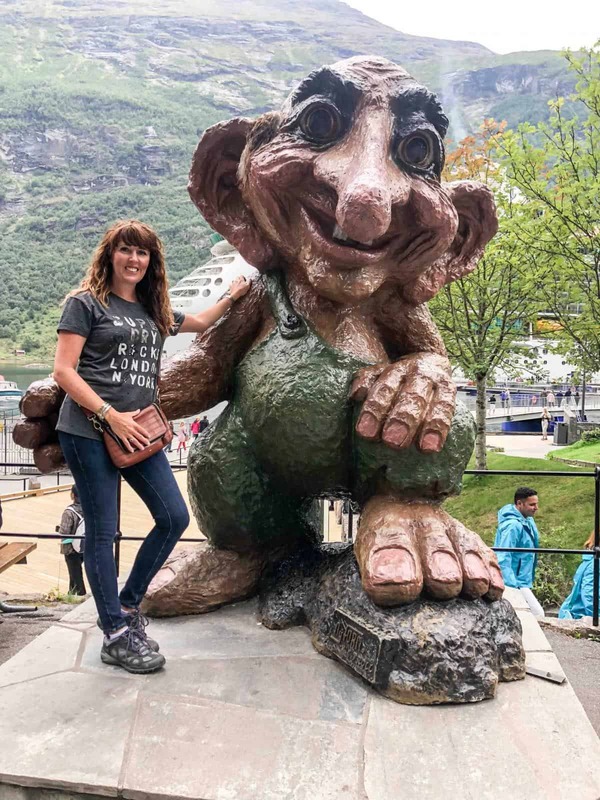 What is in the Port at Geiranger and what excursions can I do from Geirangerfjord? Explore the Waterfall walk in Gieranger in the centre of the town. Take a bus tour or book a coach trip up to Mount Dalsnibba or Eagle bend road. What is the weather in Geiranger? The Geirangerfjord is considered one of the most beautiful fjords in the world, and is included on the UNESCO World Heritage site list. In this Port Guide of Geiranger Norway you will find all there is to truly enjoy what this port has to offer. Norway and Geiranger is the perfect place to take children there is so much for them to do. You can hire Bikes, stand under waterfalls, look for trolls and do the traditional piling of stones. The Geirangerfjord is one of Norway’s most popular natural attractions and although it only has a population of around 200 people it sees many visitors each year. 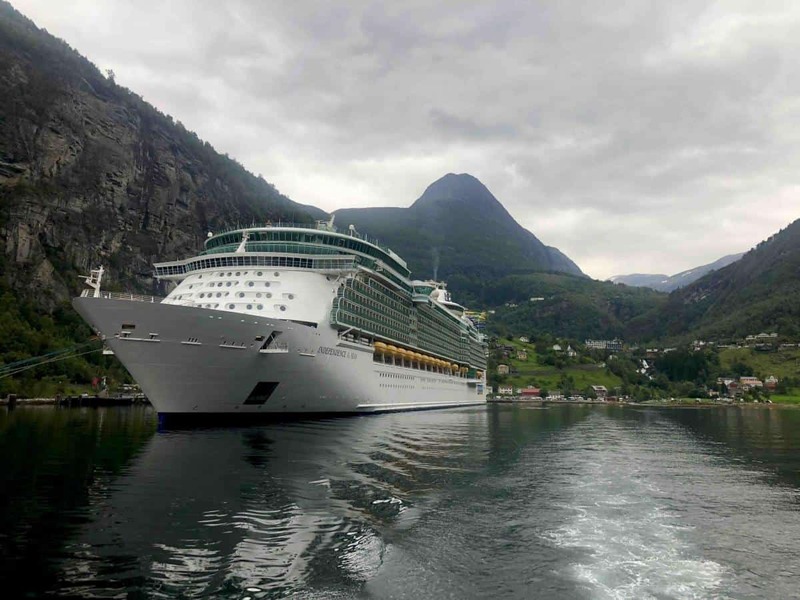 Cruising the Norwegian Fjords is the perfect way to explore this area. The route into Geiranger is stunning and can take a few hours to approach. It is worth getting up early to see the views well before you dock in Geiranger. The fjord is 260 metres deep while the surrounding mountains are 1600-1700 metres high. The fjord is also known for its spectacular waterfalls and its fjord farms high up in the cliffside. You will disembark the cruise ship by way of the new walkway. A floating boardwalk will take you directly from the ship to the portside. If there is another ship in port you may be tendered. 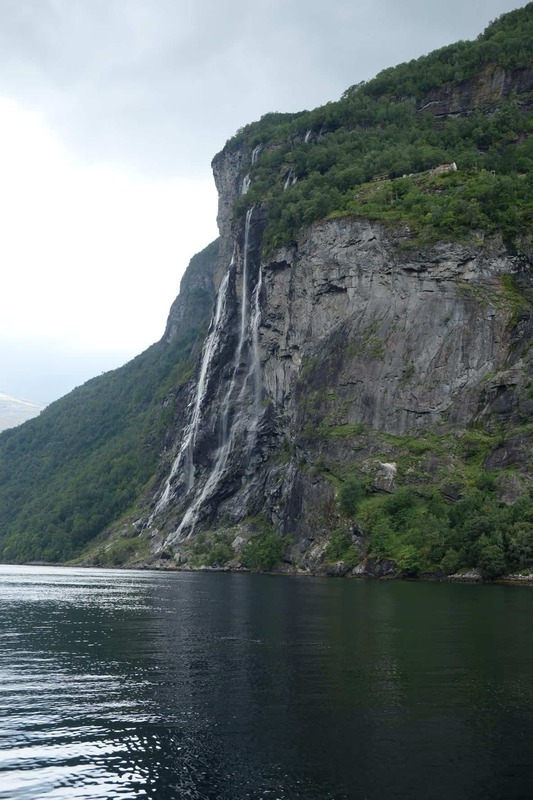 One of the best things to do in Geiranger Fjord is visit some of its many waterfalls. The best season to visit the Geirangerfjorden is late springtime or early summer when the snow melts. The Seven Sisters is the waterfall that every one comes to see. On your arrival you will be lucky enough to see the Seven Sisters waterfall from the comfort of your ship. On your approach to Geiranger you will sail straight past it. You could also take a trip out to see the waterfalls up close. If you do this you will also see the Bridal Veil waterfall and the Friaren waterfall which means suitor and is shaped like a bottle. There are various boat audio tours that can be booked either online or directly from the port tourist office. One of the easiest waterfalls in Geirangerfjord is the Fossevandring and it is a 10 minute walk from the port. This is perfect if you do not want to do an excursion and just want to see directly what Geirangerfjord has to offer. You can walk to the bottom of the waterfall which is directly in the centre of town and easy to see. You may then choose to climb the 327 steps to the top of the waterfall for the views and a visit to the Norwegian fjords centre. 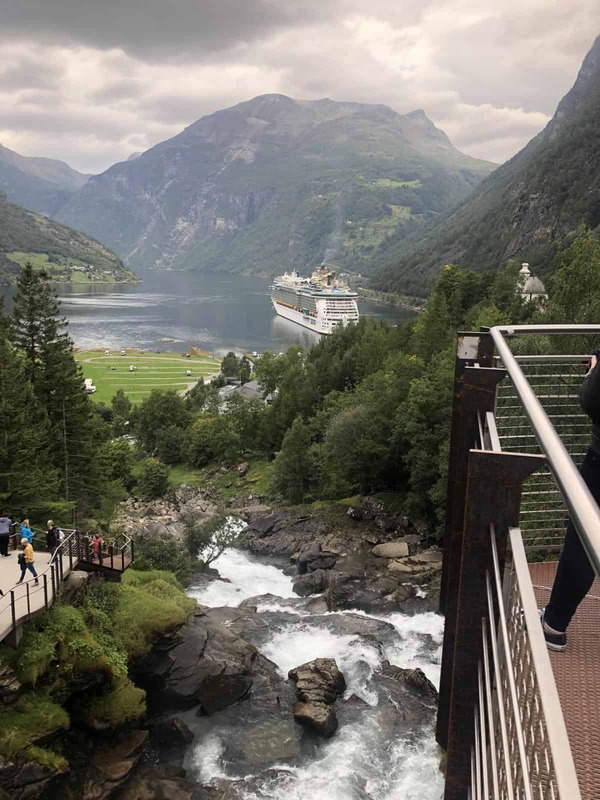 Here you will find all of the information on the wWorld UNESCO site of Geiranger, including the way of life, history and scenery and the latest updates on the technology used to check for landslides. 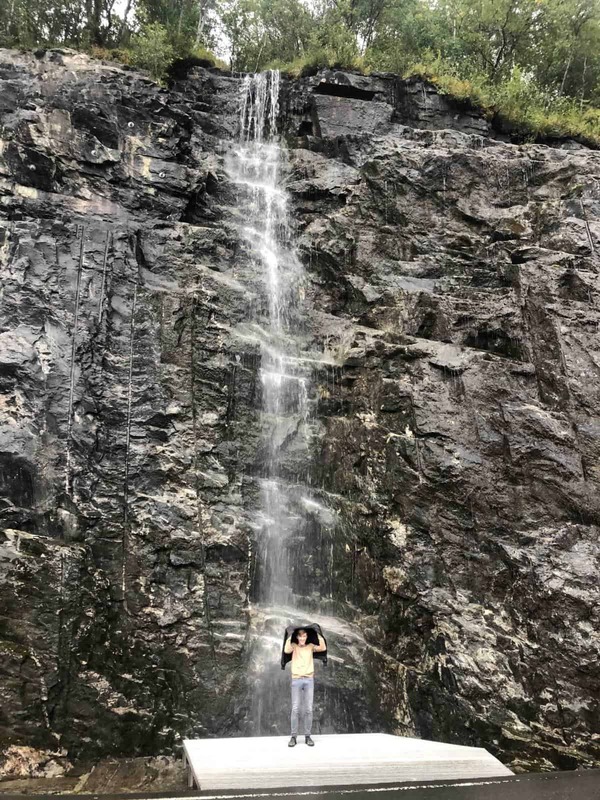 Take a hiking trail to Storsæterfossen waterfall where you will actually take the trail behind the waterfall and stand under it. There are signposted trails from Geiranger where you can also purchase or borrow a walking stick to help you on your route. 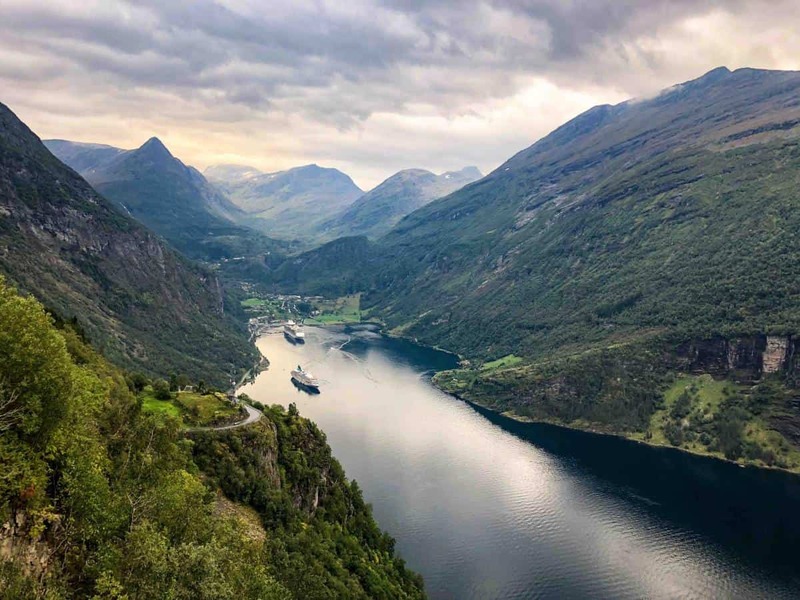 Eagle bend road and viewpoint is a wonderful place to get a good view of Geirangerfjord.The Eagle bend road has 11 hairpin bends and is one of the main routes in to Geiranger. There is a newly constructed viewing point and even a small waterfall you can stand under should you wish. The view over the Fjord here is just amazing. There are many ways you can see this, You could book a bus tour or even hire a Twizy electric car. 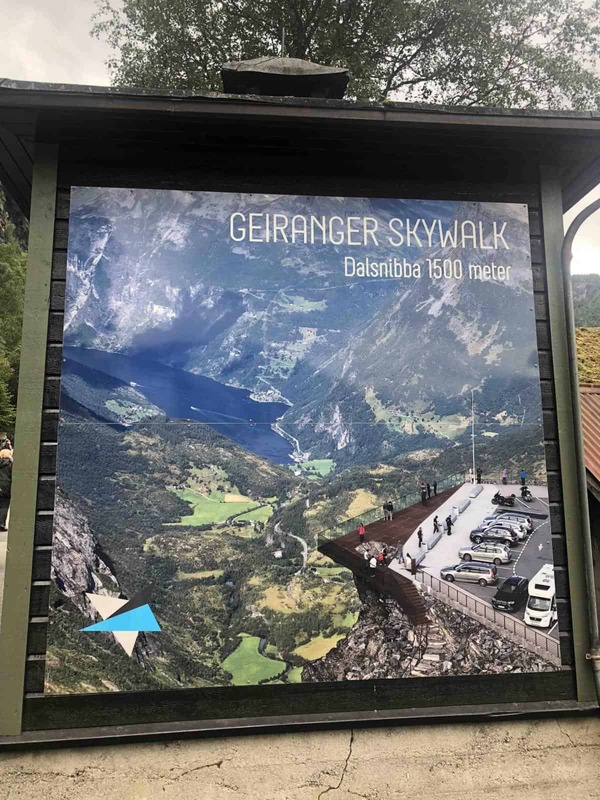 Mount Dalsnibba has a fabulous viewing point called the Geiranger Skywalk. This is only open during the summer months when there is no snow. There is a shop and cafe here at the top and with the most superb views if the weather is on your side. 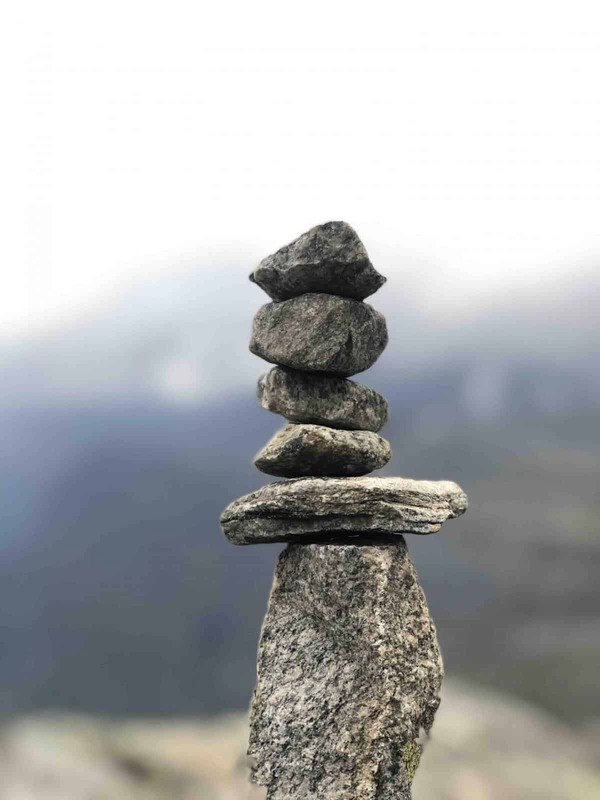 One thing that everyone loves to do is stack stones to ward off trolls at Mount Dalsnibba. You will see these everywhere and your children will love it. For more tours visit Fjord tours where you can Hire bikes, cars or take a boat trip. Dont forget to find the Trolls! Most cruises to Geiranger take place between May to september when it is less cold. With the longest days being July and August this is generally the best time to visit when there is less snow and plenty of action from the waterfalls. The currency is the Norwegian krone (NOK). There is an ATM at the supermarket and you can also exchange currency at the Fjordbuda souvenir shop. It is very expensive to eat and drink in Norway so it may be cheaper to go back to the ship for lunch or take a packed lunch. 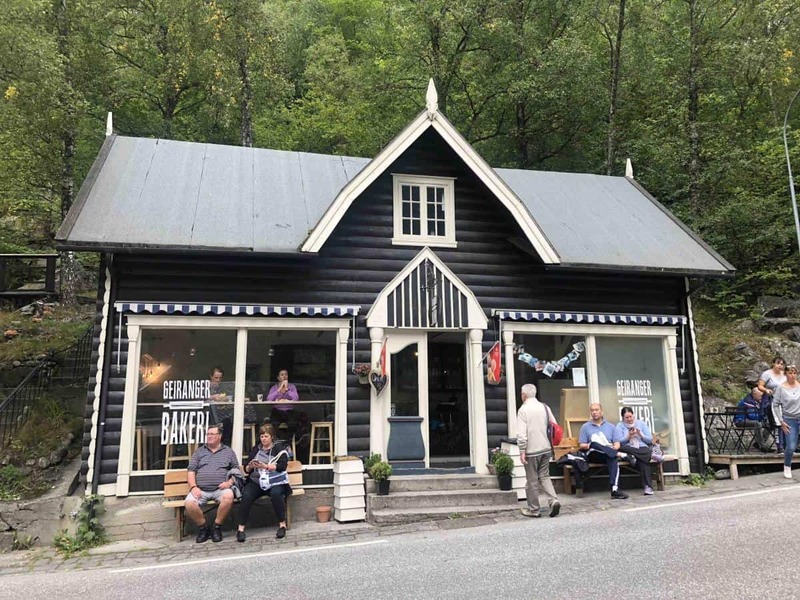 What can you buy in the shops at Geiranger? knitwear, as well as troll figures and other souvenirs. You can also purchase winter down filled coats that are great value for money. Check out this handy map guide to whats in the port. Be aware there can sometimes be a few ships in the port at any one time so it can get busy. Prebook any tours you want to do prior to your visit. The weather in Norway can be unpredictable. Take plenty of layers. 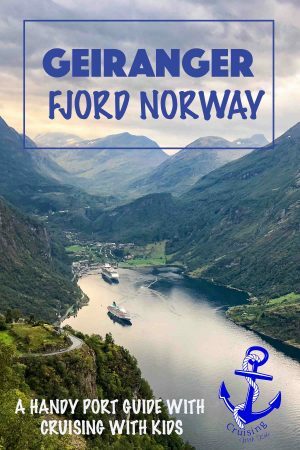 This Port Guide of Geiranger Norway will help you navigate your way around the town. 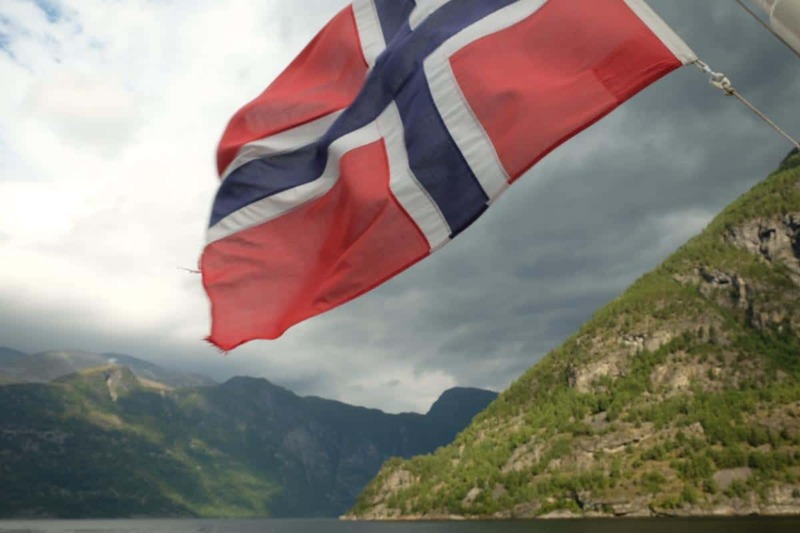 Most importantly enjoy your time in Norway and check out our other port guides.